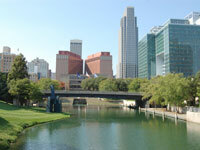 AMCON Distributing Company headquartered in Omaha, NE. Together with its wholly-owned subsidiaries (collectively “AMCON”), is primarily engaged in the wholesale distribution of consumer products including cigarettes and tobacco products, candy and other confectionery, beverages, foodservice, groceries, paper products, automotive and health and beauty care products. In addition, the Company operates twenty-two retail health food stores in Florida and the Midwest.